Since my copy of the game did not include the instructions and I couldn’t find a complete set of the rules anywhere, this description of the rules comes from various bits and pieces found on the internet. If there are any errors in these rules, feel free to leave a comment and I will gladly change them. In 2nd Guess the object of each question is to guess the “2nd best” answer. 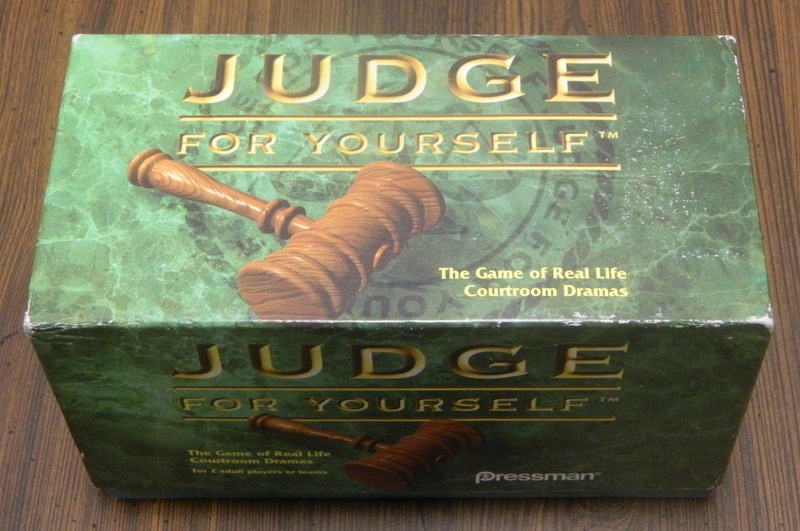 Players take turns being the reader while one player is the main player for the round. The main player gets to pick one of the three questions on the card and the reader reads the question. The player can either answer the question right away without getting the multiple choice answers or they can choose to receive the multiple choice answers. If they answer correctly without the multiple choice answers, they get four points. If they answer correctly with the multiple choice answers they get two points. In either situation if they guess correctly they get to answer another question from the card (up to the three questions printed on the card). If the main player guesses incorrectly their turn is over. Here is a picture of a card from 2nd Guess. The current player is allowed to pick one of the three questions to try and answer. In addition to receiving less points by choosing to see the multiple choice answers, the main player also gives the other players a chance to earn some points. Before the main player makes their selection, the other players use their multiple choice markers to indicate what they think the main player is going to guess. If any of these players correctly guess what the main player picks, they get some points (I am guessing either one or two points). Play continues until the predetermined number of rounds or score is reached. Whoever has the most points wins the game. While 2nd Guess tries to do something “new” with the trivia genre, it fails to be anything more than a below average trivia game. 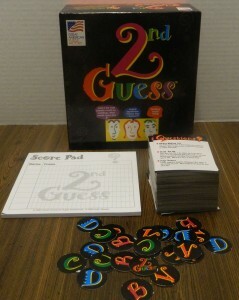 The biggest problem with 2nd Guess is that it is just plain boring. Outside of the gimmick of having to pick the “second best”, the game adds nothing to the trivia genre. Unless you are one of the few people who have never played a trivia game, you have pretty much already played 2nd Guess. You just ask and answer questions earning points for correct answers. Since there are so many trivia games on the market, a trivia game needs to stand out in some way in order to be of any interest. 2nd Guess just doesn’t stand out in any way. In addition to not adding anything to the genre, the questions in 2nd Guess are just kind of boring. I don’t know what it was but it just seemed like none of the questions from our game were particularly interesting. 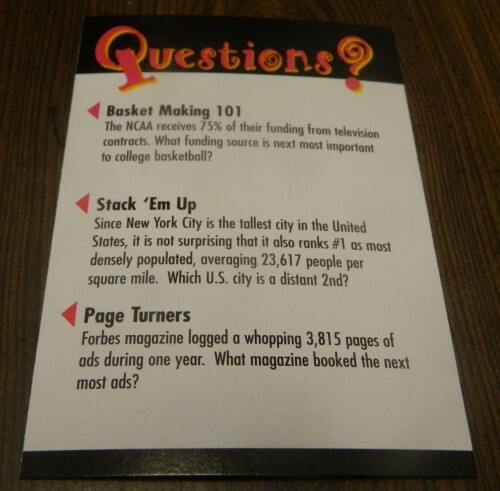 Due to the premise of the game, all of the questions had to be about subjects where there is a second best. Most of questions seemed like they were just taken from a top five/ten list. A lot of questions also have needless “flavor” text which adds nothing to the question. For example one question in the game I played started with talking about sushi and moved onto asking what was the second most expensive city in the world to live in. That is kind of a stretch as well as a waste of time since the question could have just as easily asked what city was the second most expensive to live in. Another problem I had with the questions were that unless you were very knowledgeable about a topic, there was no way you were going to be able to guess without knowing the multiple choice answers. This is disappointing since one of the few “new’ things that 2nd Guess did was to give players more points if they could guess the correct answer without getting the multiple choice answers. This mechanic could have made 2nd Guess somewhat interesting but it doesn’t work. Unless you are confident of the correct answer you are usually better off just taking the safe path and getting the multiple choice answers rather than just making a guess. I also didn’t like the mechanic where the other players guess what the main player is going to pick. I may have gotten the rule incorrect since I had to piece the rules together from various places on the internet. If not I think this rule is kind of stupid. Instead of trying to guess what the other player is going to pick, the other players should have tried to guess the correct answer. I actually found it to be harder to guess what the other players would pick than guessing the correct answer. I would recommend playing the game where the other players receive points if they guess the correct answer. 2nd Guess’ components are nothing special. The game comes with 220 cards/660 questions which is not bad. The cards are made from pretty typical card stock. The multiple choice markers are made of a pretty thin cardboard and could very easily crease/tear. The biggest problem with the components is that 2nd Guess didn’t seem to put a lot of care into the questions. In the short time that I played the game, my group discovered a couple grammatical and spelling errors. While the occasional grammar and spelling error is acceptable, I find it alarming that we found several errors in the few cards that we played. Unless we just happened to pick all of the cards with errors, there is likely quite a few more cards that have errors. While this doesn’t break the game, it shows a lack of polish that is disappointing. 2nd Guess is just not a very good trivia game. It really doesn’t add anything new to trivia games. The only thing it may be able to claim as its’ own is the gimmick of trying to guess the second best. This gimmick is pretty boring and doesn’t really add anything to the game. The game works fine as a trivia game but it is a pretty boring trivia game. 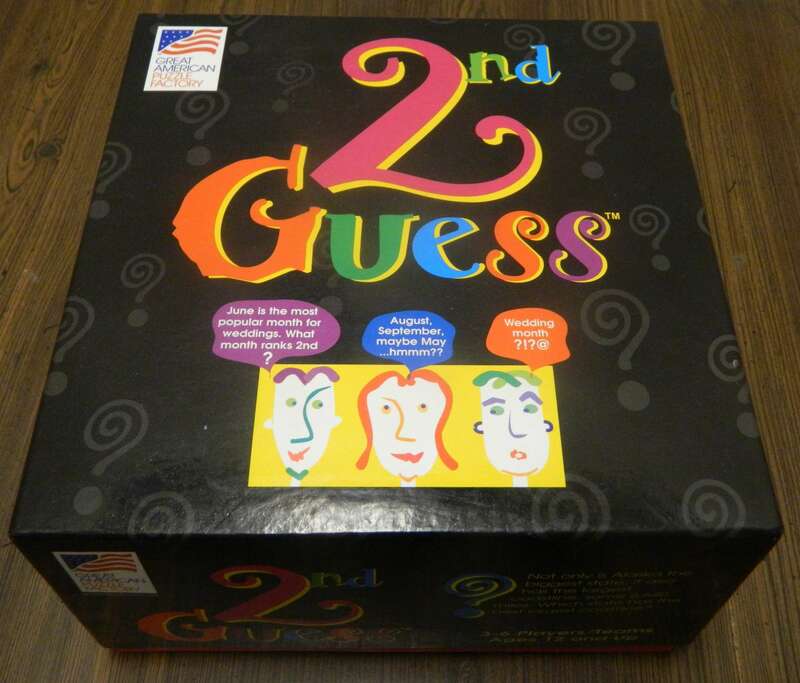 The only people I could recommend 2nd Guess to would be people who love trivia games and think the “second best” gimmick is interesting. 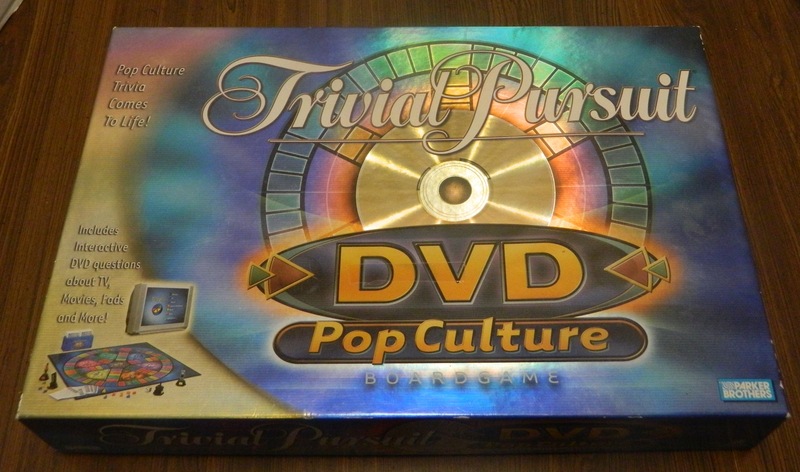 Fans of trivia games may get some enjoyment out of the game. A pretty boring trivia game. Outside of the "2nd best" gimmick, the game really doesn't add anything new to the genre.